Pitching travel stories can be a mystery to new writers. When I first started travel writing, I had no clue how to go about pitching travel stories to magazine editors. Completely lacking experience, I felt totally lost about how to sell my stories. First, when you're pitching travel stories you need to come up with an angle (or story idea) that you think a magazine editor will be interested in publishing. There’s an art to this, and it comes with time and experience. 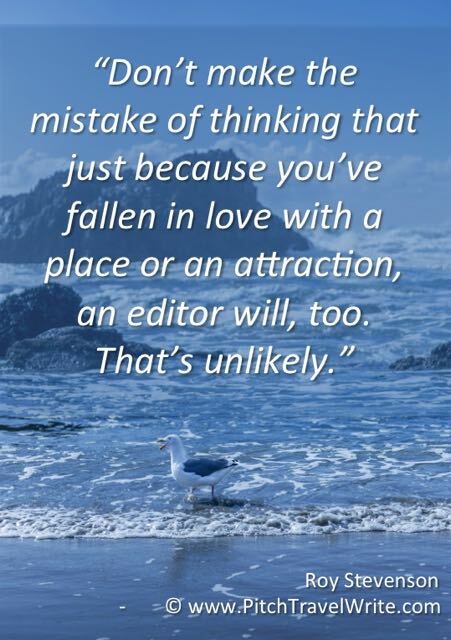 Don’t make the mistake of thinking that just because you’ve fallen in love with a place or an attraction, an editor will, too. That’s unlikely. Instead, your job is to find something unique, distinctive, and interesting about the place that will ‘wow’ the editor and obviously, the magazine readers. I’ve written several articles about dreaming up travel story ideas and they’re all posted on this website. Once you’ve come up with a marketable story idea, your next step is to hunt around for potential markets that might be interested in your idea. Pitching travel stories is impossible unless you have a market to sell them to. You do this before you write your query letter and before you write your story. There’s no point writing up a query letter if you only have a small selection of magazines to pitch. The fewer target magazines on your list, the lower your chances of getting your story picked up. Don’t waste your time trying to sell stories with only a few potential magazine outlets. I’m a big believer in querying any magazine that I think my story would be a good fit for. If I’m in any doubt about whether a magazine is a good fit, I put it on my distribution list. Locate at least one dozen potential magazines for each of your stories. For novice writers and bloggers without any bylines to speak of, I highly recommend you come up with a list of 20+ magazines that you consider fair targets for your story. 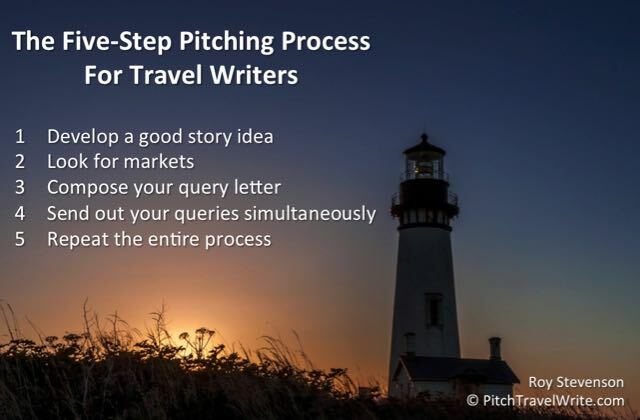 Pitching travel stories to a large list will increase your chances for success. Creating these lists can take a considerable amount of time, but it is an essential piece of the marketing process. Neglect this step and you’ll be left scratching your head, wondering why you couldn’t sell your story. There are no short cuts to this process. But there are plenty of services that you can utilize to build your own magazine distribution list. 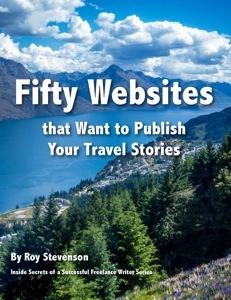 I’ve published two helpful eBooks (above) with comprehensive listings of print and online targets for your travel stories. 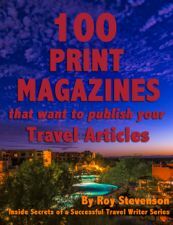 Besides having detailed advice about how to go about pitching travel stories to different markets, the magazine and website lists included in these eBooks will save you dozens of hours of time. You can use them as a foundation for your own lists. Click on the images above or on this link to learn more. I compose my query letters only after I have a solid distribution list of magazines. Pitching travel stories to editors is more successful when you find interesting, obscure facts about your destinations. Mastering the art of creating enticing query letters takes a lot of experience, and learning through trial-and-error. I’ve written the definitive book about query letters for travel writers. It includes twenty real query letters that were successful in selling my travel articles, and I included specific information about why they were successful. 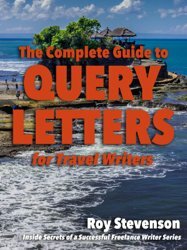 You won’t find one anywhere else in the world that specifically addresses how travel writers should create their query letters. And you can modify my successful query letter samples to create your own templates, saving you time and struggle trying to figure out how to do it yourself. Here's an article I wrote about the 3 best query letter books on the market to improve your travel writing pitches. Once you’ve written your seductive query letter, blast it out to ALL of the magazine editors on your list simultaneously. Yes, ALL of them. Not just the few magazines that you’d like to see your story published in—the entire list. The days where freelance writers could target one or two magazines are long gone. This piecemeal approach leads to slow starvation. Don't hold back with your pitching. Pitching travel stories is unpredictable. You never know which magazine editor will go for your story and which editors will ignore your query, so you must pitch them ALL. I’ve noticed a tendency for beginning travel writers to sit back and wait to hear from the editors after sending out a batch of query letters. This is a waste of your time. You need to keep pitching travel stories! Instead of waiting to hear back from these magazines, start working on your next story idea and distribution list. You need to keep the momentum going. It's one of the big marketing mistakes to sit back and wait. I addressed this in more detail in a separate post. Come up with another marketable story idea and build a distribution list around it. Then, crank out your query letter and blitz it out to the editors on your list. Then, dream up another story idea, and repeat the whole cycle again and again. For all but the most talented (or lucky) novice travel writers, almost all of your time will be spent going through this cycle. Dreaming up a story idea—creating your distribution list—writing your query letter—sending it out. Get good at this. Get to love it because you’ll be doing it for many years. Eventually, you’ll start getting acceptance letters back from some editors. As time goes on, as your story ideas improve and as your query letters become more polished, you’ll get more and more acceptance letters back from editors. The editors will say they like your story, and they’ll give you information like how many words it needs to be and the deadline for submission. They should also tell you how much they will pay for your story and if they pay upon receipt of your manuscript or upon publication. New writers are usually so excited with an acceptance that they forget about some of these details. Many unsuspecting freelance writers, including me, have been screwed or disappointed because we failed to establish these important contractual items before we wrote our articles. If these four items have not been mentioned in the editor’s acceptance email, then you need to email the editor back and ask those questions. Once again, do not write your story until you have an acceptance email from the editor that states all of the above terms. Once you have secured an assignment from a magazine editor with these terms agreed upon, you are ‘cleared’ to write your story. What do you do if there are no takers for your query? Put the story idea on the back burner and move on. When you're pitching travel stories, just because there’s no interest doesn't mean that it can't be sold in the future. Wait a while then try again. I have resurrected many story ideas that did not work out the first time around. By waiting a while and trying again, I eventually sold them. It’s important to study and know about the publications you’re pitching before you write your query letter. You want to have a good idea of the “voice” of the magazine and the magazine’s audience. I can’t even begin to count the number of hours I’ve spent thumbing through the magazines in local bookstores. Some of the employees at my local Barnes & Noble even know me by name. They also tell me about new magazines on the market, which is a big help. You can also read my article about where to pitch travel stories. Probably that will never happen, but we all dream about these gigs. The writers you see on the masthead of the glossy six-figure circulation magazines have worked their way up the travel writing totem pole over a long period of time. They got published in smaller magazines to start with, and slogged away, pitching the ‘biggies’ over many years. They kept the faith and kept on pitching. The five-step process in this article will work for you as it has worked for me and many other writers. Follow these steps and just keep pitching.